The Design Museum invites you into the world of fashion designer Paul Smith, a world of creation, inspiration, collaboration, wit and beauty. Looking to the future as well as celebrating his career to date, the exhibition will reference Paul Smith’s influences and fashion designs, charting the rise of one of the world’s leading fashion brands. Looking at the impressive scale of its global operation today, the exhibition will draw on Paul Smith’s personal archive, from the company’s beginnings in Nottingham to its international prominence today. The exhibition will explore how Paul Smith’s intuitive take on design, together with an understanding of the roles of designer and retailer, have laid the foundations for the company’s lasting success and offer a unique insight into the magnificent mind of Paul Smith. ‘Hello My Name is Paul Smith’ will take visitors on a journey through Paul Smith’s world. The exhibition will showcase and celebrate the brand through collections selected by Paul. The different stages of design and production will be explored, offering a rich insight into his design process and highlighting how the principles of traditional craftsmanship of tailoring and techniques are retained but given a contemporary edge. 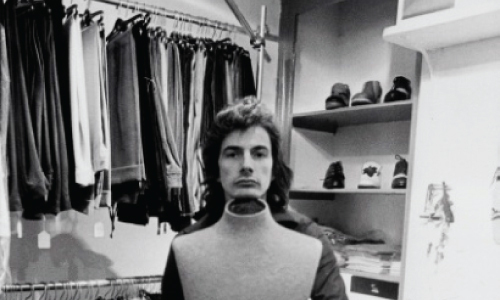 Paul Smith’s first shop in Byard Lane, Nottingham, which measured 3m x 3m, will be recreated in the exhibition alongside an immersive digital room rich in still and moving image. Thoughts narrated by Paul himself and sounds will place you in the mind of the designer. The exhibition will include a recreation of Paul’s personal office, containing a myriad of books and objects that are a continual source of inspiration. Projections, audio and film clips from fashion shows and behind-the-scenes will reveal the inner workings and influences of the Paul Smith brand. Showcasing a selection of jewellery, books, art and antiques that compliment the clothing collections, every Paul Smith shop is unique and will also be explored in the exhibition. From humble beginnings in a Paris hotel suite in 1976, the company now shows seasonally in London and Paris fashion weeks and includes fourteen different collections. As a result, and in spite of its scale, Paul Smith has retained something unique, a personal touch. Welcome to the world of Paul Smith.